Voters overwhelmingly approved big investments in car-free transport, which Mayor Hancock said was "absolutely" a referendum on the importance of sustainable transportation. Denver voters overwhelmingly approved $937 million in civic improvements Tuesday, nearly half of which will fund transportation. Of the seven ballot questions, Denverites approved the “transportation and mobility” package most decisively with 73 percent of voters checking the box. About 67 percent of the $431 million dedicated to transportation will fund projects to improve walking, biking, and transit. At a press conference Wednesday morning, Mayor Michael Hancock thanked voters for approving the bonds, which will fund projects to be implemented over the next 10 years. He also said this infusion is just a down payment on Denver’s transportation needs — that the city still must create new funding streams. “This package of projects in this bond is really the first step to an overall transportation and mobility priority setting and investment that we’re gonna have to make in this city for the next 12 years,” Hancock said. The administration has claimed it’s only $350 million short of what it needs to cut solo driving commutes from 73 percent to 50 by 2030, and double the share of walking, biking, and transit trips in the process. It’s unclear where Hancock will find that money, but city officials have floated the idea of higher parking rates to raise at least some of it. Though the transport measure prioritizes walking, biking, and transit, the single biggest item is $101 million for deferred road maintenance. The bond also ensures the widening of 56th Avenue through Montbello to make room for more cars — a step in the wrong direction for a city looking to decrease car trips. During the citizen-led project selection process, residents questioned why taxpayers should borrow any money at all for new car-centric infrastructure and general maintenance, a basic city necessity that the annual city budget should cover. The Hancock administration will hire a project manager to oversee the implementation of the projects, which total about 460 citywide, early next year. The framework for several transportation projects is in place, however. 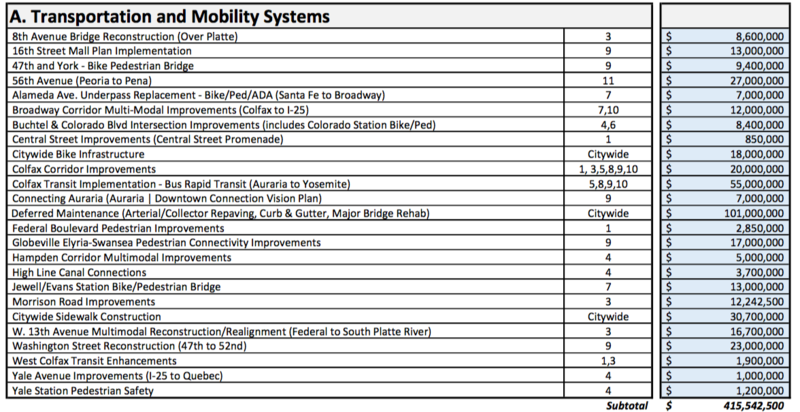 Denver Public Works currently has a program for building bike lanes, for instance, and the Colfax BRT project is already on track for implementation. In a separate vote Tuesday, East Colfax businesses and commercial property owners voted to allow higher property taxes to complete sidewalk construction and streetscaping. Now that the bond measure is approved, Streetsblog will break down each project over the coming months. Stay tuned. I heard they held a Yuge Party to celebrate the widening of E 56th Ave in NE Denver? Srsly though by the time they made all their changes this was a well-thought-out, balanced smorgasbord of projects designed to appeal to All The Voters. I would especially applaud the improvements in neighborhoods that have been more typically overlooked. On the negative side, after years of tame inflation I’m starting to hear stories of construction costs jumping like a jack rabbit.